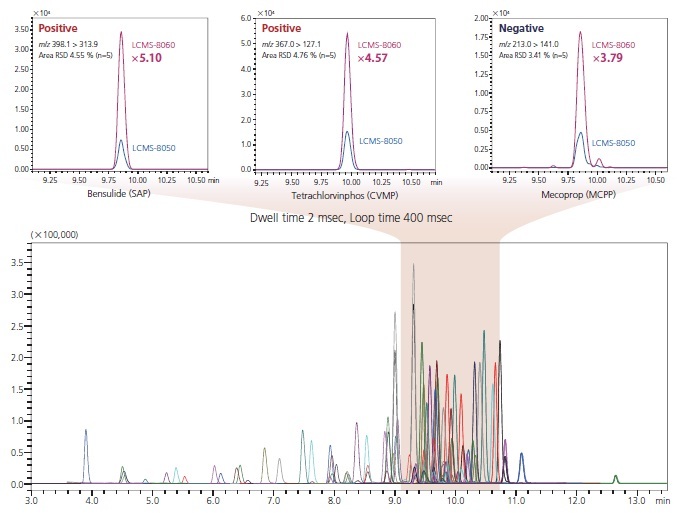 Inspired by the need to balance advanced high speed MS/MS detection technologies with unrivalled LC performance, we were the first mass spectrometry company in the world to deliver a scan speed of 15,000 u/sec and a polarity switching speed of 15 msec. In the LCMS-8060 the scan speed is now increased to 30,000 u/sec and a polarity switching speed of 5 msec making a real difference to working better and faster. The LCMS-8060 uses UF Technologies to switch polarity in 5 msec. Fast cycle time helps to detect more compounds with greater confidence and precision. Faster polarity switching time maximizes dwell times and helps to optimize the cycle time of LC/MS/MS methods. Comparing the differed polarity switching times from 5, 20 to 50 msec. Ratio of dwell time (blue), pause time (red) and polarity switching time (green) in 400 msec of loop time when 65 of MRMs are simultaneously monitored.